Jose Davila Installation view: Stones Don’t Move at Sean Kelly, New York. Photograph: Jason Wyche, New York. Courtesy of Sean Kelly, New York, 2016. 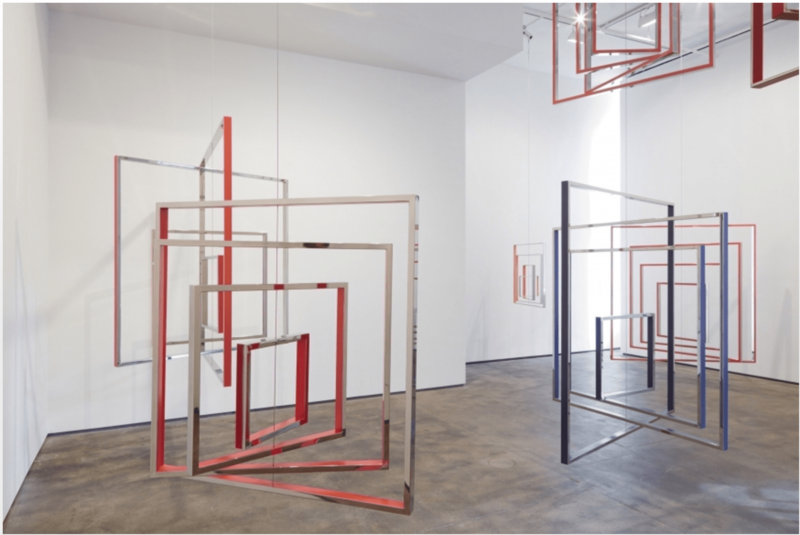 In Jose Dávila’s second exhibition with Sean Kelly Gallery, he continues his exploration of the effects and constant reinterpretation of modernism by paying homage to a range of artists. This recurring theme of homage is abundantly present in the first room, where viewers are greeted with seven hanging mobile sculptures of squares suspended at different heights from the ceiling. Each sculpture has four square polished steel frames, reminiscent of stretcher bars before canvas is stretched over it, or a picturless frame descending in size, each painted on the inside and outside, hanging from a wire so that the smaller squares are hanging and spinning inside a bigger one. These sculptures are from a continuing series titled Homage to The Square, a simple, obvious gesture. Here he is nodding towards not only the form of a square but to Josef Albers who often had the phrase “homage to the square” in his titles, as well as the countless artists who have dealt with the simplicity and perception of the square like Donald Judd. Even though there is a pronounced relationship to Albers, the structures’ lack of an image within the “frame” emphasizes craftsmanship of the structures and the negative space in between them, leaning away from the realm of painting. His choice to install the sculptures as mobiles rather than on the wall (another nod- this time to the originator of mobile sculptures, Alexander Calder) pushes the works further away from painting into a sculptural territory. Through this constant repetition and examination, he is paying tribute to other artists in his seriality, such as Judd, who have done the same. Jose Dávila, Installation view: Stones Don’t Move at Sean Kelly, New York. Photograph: Jason Wyche, New York. Courtesy of Sean Kelly, New York, 2016. In the main room, Dávila demonstrates his range as an artist through a series of cut-outs, a painting, and sculptures. The image represented in the framed archival print cutouts are Roy Lichtenstein’s Femme d’Alger (1963), which according to the press release was inspired by Picasso’s own Les Femme d’Alger (The Women of Algiers) (1955), which in turn was inspired by Delacroix’s The Women of Algiers in their Apartment (1834). In this series cut-outs, Dávila removes a section or a plane of color at a time, so that by the 12th and final cutout of the series, he is left with a graphic black and white image that is hardly recognizable as a Lichtenstein. By choosing Femme d’Alger as his subject for the cut-out, Dávila is thrusting himself into a longstanding tradition and this gesture is reminiscent of Robert Rauschenberg’s action to erase one of De Kooning’s drawings bought at auction. 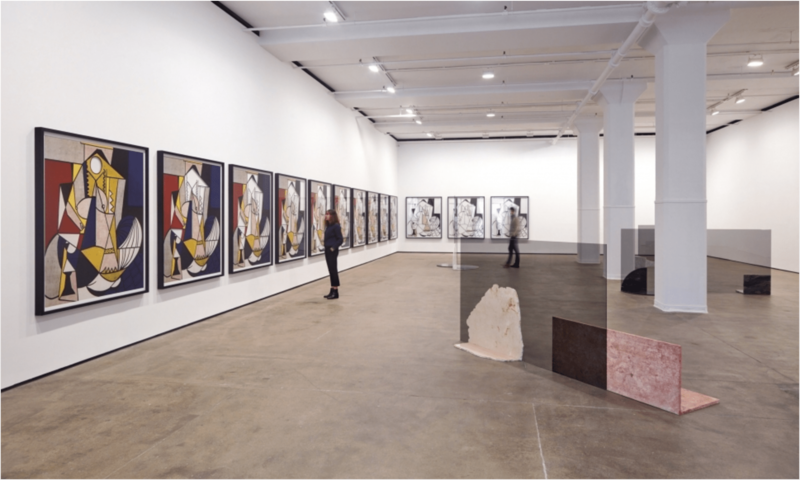 Jose Davila, Installation view: Stones Don’t Move at Sean Kelly, New York. Photograph: Jason Wyche, New York. Courtesy of Sean Kelly, New York, 2016. There is one painting in the exhibition and it is derived from a text, labeled in the paintings as “Detail from the (west) passion window, Chartres,” presumably from a description of a stained glass window at Chartres Cathedral, a Gothic Catholic cathedral in Chartres, France. The text speaks of simplicity in form, and in addition to informing the sculptures in the room, references Dávila’s own background in architecture. The sculptures juxtaposing smoked glass and marble expand upon another series Joint Effort, where the artist has previously used ratchet straps to carefully balance glass or marble (at a 90 degree angle) at different angles to create a moment of tension starting around 2014, some shown in his last exhibition “Lightness of Weight, at Sean Kelly. The tension and power balance between the materials apparent in his earlier works a couple years back are not present with the new body of sculptures in 2016, as there is more material manipulation, and less balance involved. The loss of tension in the balance of the sculptures is not necessarily a negative, as the contrast between the stained glass and marble forms bring about poetic grace that his past sculptures have not. In the downstairs gallery at Sean Kelly, lies a series of drawings on paper aptly titled A Copy Is a Meta-Original. As the title foreshadows, Dávila takes his stand on form vs content, a question that still haunts artists today, by destroying the relationship between form and content through his superimpositions. In each of the works is a text, usually about a specific drawing in a cave, with an empty box on top of the description where the image should be. Instead of the original images, Dávila makes simple, childlike-marks, where he takes his exploration of form and translates it onto paper, still pondering upon art-historical ideas of the original, and the copy as a meta-original. The marks he is making as a gesture again implicate him in the trajectory of art history, but on a grander scale than with Femme d’Alger in the upstairs gallery. By superimposing his own awkward marks onto such academic descriptions of the origins of mark-making itself, Davila brings to question what the responsibilities of an art maker are, as well as the burden of originality or authenticity in today’s saturated era. On the floor in the center of the room is a sculpture, Imperfect Circle, (2016) where he again demonstrated knowledge of sculpture in art history by nodding to Carl Andre and the minimalist notion of “sculpture as place.” This piece ties the exhibition up in a circle, leading the viewers back to the contemplation of traditional shapes that they started with in the front gallery, with the mobiles of square frames, in addition to making the most direct reference to the title. All in all, the exhibition is a superb combination of homage to artists that have influenced Dávila, contemplation of literal and metaphorical form and content, and a dedication to education in all disciplines regarding art, architecture, and art history. Jose Dávila is an artist that lives and works in Guadalajara, Mexico. His exhibition “Stones Don’t Move,” was on view at Sean Kelly Gallery, New York, until December 3rd.